Miley Cyrus had the second worst day of her life yesterday when she found out her dog Floyd had passed away. 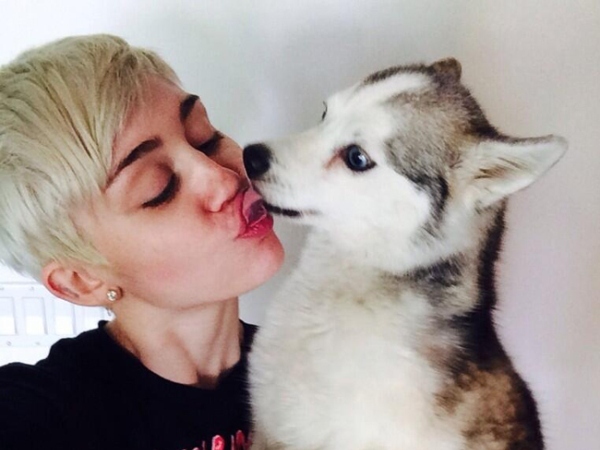 Miley Cyrus' beloved dog Floyd has died. The Wrecking Ball singer is completely devastated after one of her pet pooches, an Alaskan Klee Kai that she got in 2011, passed away yesterday while she was on her Bangerz world tour. The heartbroken star posted on Twitter: "Today is the 2nd worst day of my life. I don't wanna say it because I don't want it to be real... But my precious baby Floyd has passed away. I am broken. I know I don't mean it but I wish he would've taken me with him this is unbearable. What am I gonna do without him? I am miserable." Miley (21) also apologised to her fans in advance if her performance is a little lacklustre at her Boston show tonight after sharing two pictures of her cuddling up to the pup. She added: "I'm sorry in advance if I am not myself tomorrow Boston. I will try my best to be my best." The distraught Disney star's followers were sympathetic about her loss, and soon got "#RIPFloyd" trending on Twitter. Miley - who owns several rescue dogs - is no stranger to coping with canine death after her Yorkshire terrier Lila was fatally attacked by her English bulldog Ziggy in December 2012. The former Hannah Montana singer even dedicated her performance at the VH1 Divas concert to her departed mutt. She wrote on Twitter at the time: "For everyone asking... I have never been so hurt in my life. My heart has never been so broken..... Lila my sweet baby girl has passed away."